We don’t just run leadership development programs. We make long-term investments in young people and their communities. We believe developing future leaders is a critical local and global issue. In ten years from now, the young people of today will have the opportunity to take on positions of leadership in nearly every area of business and commerce including government, education, technology, energy, science, medicine, religion, finance, military, manufacturing, retail, entertainment, and much more. What kind of leaders will they be? What attitudes, knowledge, skills, and habits will they have developed to help guide them? How will they engage in their local communities? What first-hand experiences will they have had to lead in a 21st-century world? And who is going to have the opportunity to receive such high-quality leadership mentoring? These questions and their solutions are at the foundation of our Leadership Philosophy. A mentor-mentee relationship- A caring and mutually respectful relationship with a knowledgeable leadership mentor can have profound impacts on the lives of young people. That is why every participant is matched with a leadership mentor throughout the entire program. Long-term engagement and consistency- Developing leaders require long-term periods of consistent engagement; there are no shortcuts. That is why all our programs are a minimum of 6 months, include weekly mentoring sessions, and have multi-year matriculation options for continued leadership development. Engagement in positive action- It is not enough to have the necessary attitudes and knowledge needed to be a leader. An effective leader must also put those into action. That is why our program includes engagement in local and global service to allow young people to fully develop their leadership skills and habits. Innovative learning techniques- Leaders in the 21st century must be able to use various technology tools to conduct research, communicate, and collaborate with others to solve complex problems. These tools also give access to participants regardless of location. That is why we use various technology tools to help prepare young people to lead in a complex 21st-century world. Firsthand global exposure- Becoming an effective leadership requires first hand experience with new customs, cultures, and concepts. That’s why all our programs culminate with an 8-14 day group mission abroad. What lies behind and what lies ahead are tiny matters compared to what lies within us. We define leadership in the framework of personal leadership, local leadership, and global leadership. 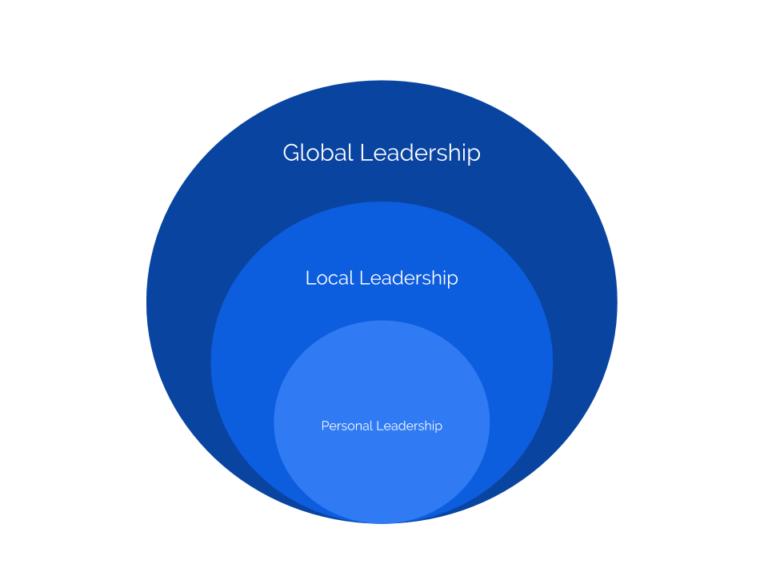 These three areas are interconnected, however, our leadership development curriculum begins with developing Personal Leadership and moves outward in concentric circles to Local and Global Leadership. Our four Leadership Pillars, each with their own set of learnings, lessons, actions, and behaviors are the foundation of our Effective Leadership Curriculum. They each are equally important, like four pillars that hold up a vaulted roof- without one, the roof would fall. So too are these Leadership Pillars interdependent to one another in respect to effective leadership development. Attitudes- The beliefs and dispositions towards ourselves and others, past and current circumstances, and future possibilities. Knowledge-The awareness and familiarity about various important content areas: gained through experience and education. Skills-The ability to do something well; gained through practice over a long period of time. Habits- A regular tendency or practice, especially one that is performed daily and is hard to dismiss. Our mission is to provide access to the highest-quality leadership development experiences in order to empower the next generation of local and global leaders to positively impact the world.